We invite you to enjoy our wonderful home on your next trip to Orlando. Absolutely perfect for multi-family groups, or golf groups, this property features all the comforts of home and more! Book your vacation now at this beautiful home with pool and spa located in the gorgeous Windsor at Wesside Gate Resort. Plus as our guest you get to enjoy all the amenities of the resort such as the lazy river, splash pool for the kids, 2 other large pools, tennis courts, fully equipped exercise room, on site cinema, arcade games, and family restaurant. You will feel immediately relaxed as you enter our 8 bedroom, 6 bathroom executive home which sleeps up to 16 comfortably, . The living area offers plenty of space for all guests to spread out. For family get togethers the dining area is ideal to share a meal around the elegant dining table or have a quick meal at the kitchen breakfast bar. 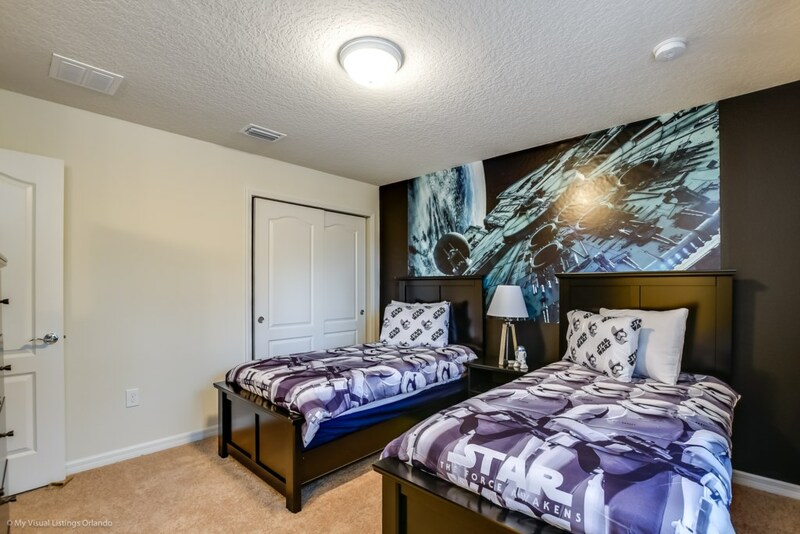 This home has 4 king bedrooms, 2 Rooms with twin beds and 2 Queen Rooms . All with flat screen TV's and plenty storage space.